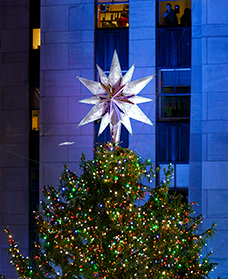 In New York City the arrival of the holidays wouldn't be complete without the lighting of the world's most famous Christmas tree at Rockefeller Center. 12 years ago Michael Hammers created the unique Swarovski Star for this particular place in the heart of midtown Manhattan. And he continued to personally take care of it each year. From the beginning it was Michael's vision of the symbol that brings light into the world, his artistic expression of the wish for peace and freedom for all mankind. May be this year the Star is needed more than ever before, when all over the world people must fear terrror and for their lives. In honor of its 50th anniversary this season New York also celebrates 'A Charlie Brown Christmas', that story that still serves to remind of the true meaning of Christmas, no matter what one's faith or religious belief is. The star-studded evening featured musical performances from Sting, Michael Bublé, James Taylor, Mary J. Blige, Andrea Bocelli, The Band Perry, Andy Grammer, Carly Rae Jepsen, Pentatonix, Band of Merrymakers and the Radio City Rockettes. Next to all the great traditions of how New York City opens and celebrates the holidays each year, this year Charlie Brown and gang are very especially featured. In honor of the 50th anniversary of the popular holiday television special, Macy's has unveiled its 'A Charlie Brown Christmas' window displays at their flagship store. Michael Hammers mentiones “I was born in 1965, so I share my 50th anniversary with Charlie Brown's Christmas! And I truly appriciate. My Star topping the Rockefeller Center Christmas Tree stands for the ingress of enternity into time, which I see as what Christmas is all about as well, Charlie." On December 9, 1965 'A Charlie Brown Christmas' made its debut on CBS as an animated television special based on the comic strip Peanuts by Charles M. Schulz. The story touches on the over-commercialization of Christmas, and serves to remind of the true meaning of Christmas. Charlie Brown finds himself depressed despite the onset of the cheerful holiday season. In desperation, he loudly asks if anybody really knows what Christmas is all about. Linus states he can tell him and, standing alone on the stage, he recites the annunciation to the shepherds scene from the Gospel of Luke: „...Glory to God in the highest, and on earth peace and goodwill towards men. That's what Christmas is all about, Charlie Brown." Chistmas Tree and Star had been set! And the show ran!